What does it take to be evangelizers in the pluralistic world we live in as Canadians? In this pastoral reflection, the Episcopal Commission for Doctrine proposes a path forward following the example of the early Church. The central theme is that of a threefold witness which manifests (1) a personal, living encounter with Christ, (2) the love lived in Christian community, and (3) service to others. 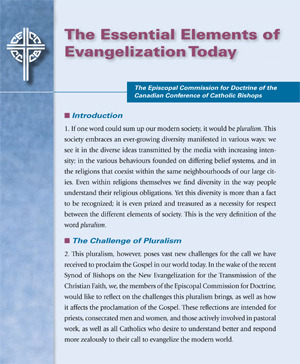 Although this text was composed prior to the release of Pope Francis’ apostolic exhortation Evangelii Gaudium (The Joy of the Gospel), its approach and recommendations are similar, while providing a uniquely Canadian perspective.